Summer is quickly coming to an end (yeaaaaah!!! I’m a fall fanatic!) 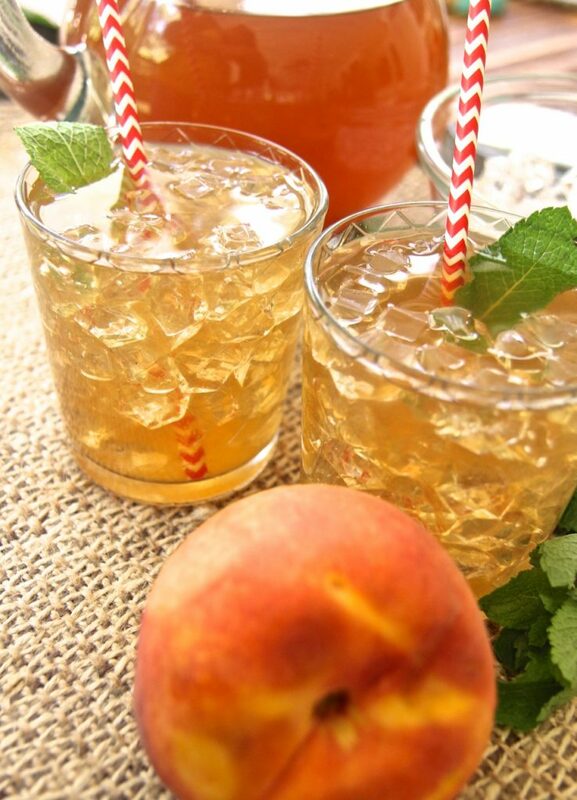 but I couldn’t let this season pass without making some good ol fresh, southern peach iced tea! What is it about making fresh fruit sweet teas that makes me feel all domestic and pioneerish? Like I’m living off the land or something. I know, far stretch. Fresh peach iced tea made with fresh peach syrup is a mini labor of love though compared to making plain sweet tea and it’s so worth! Hey I’m a classic sweet tea girl through and through! I prefer not to have a lot of bells and whistles when it comes to my sweet tea. However during the summer I like to take advantage of summers bounty by incorporating fresh fruit, like raspberries or peaches! Fresh peach iced tea is my second favorite! It’s delicious and so refreshing, especially if you’re a peach lover like myself. I can sit out on the back porch with a good book, a gentle breeze and a glass of fresh peach iced tea and be just as happy as a lark. Only that never happens in real life around here. Not without the boys calling my name a million times. A girl can dream though. Just promise me that you will serve this super cold and let it sit for a few hours to really let those juicy peach flavors do their thing ok? Promise? Watch me make this Southern Fresh Peach Iced Tea from start to finish! In a large saucepan, add peaches, 2 cups water, 2 cups sugar and lemon zest if using. Bring to a light simmer and simmer covered until peaches are soft and the peach skins has lost it's dark peachy color, about 15-20 minutes. With a potato masher, mash the peaches to release more of the juice and continue simmering for about 10 more minutes. Strain the peach mixture through a mesh strainer and discard the solids. 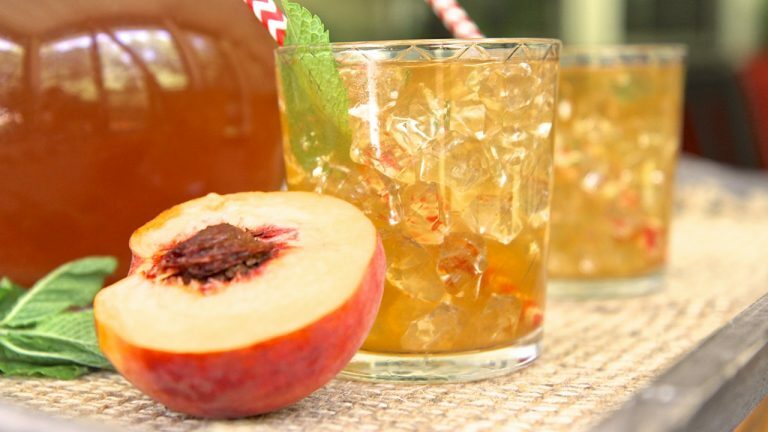 (You'll have about 3 to 3½ cups of peach syrup) Set aside. Place tea bags in water and let them steep for about 10-15 minutes and then discard tea bags. Stir before serving and pour over ice to serve. 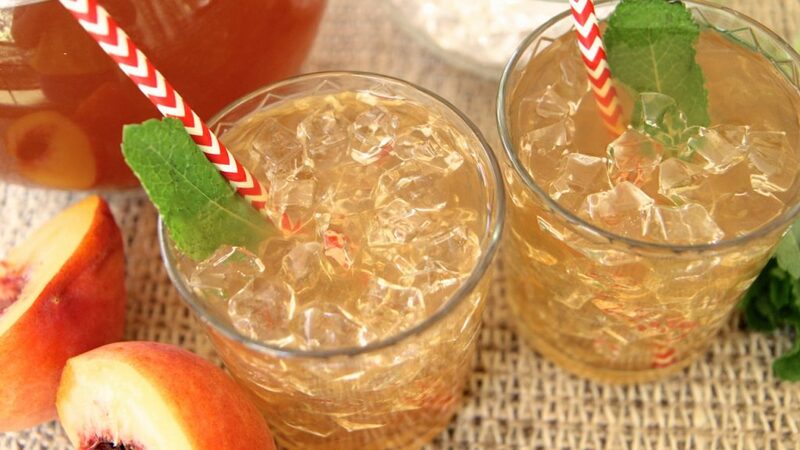 Garnish with mint and fresh peach slices if desired. Delicious! Best peach tea I’ve ever tasted.